Since we all can’t stop talking about Jack Bauer and the old hit series ‘24‘, Fox has heard our cries and is looking to bring back the super-tense series ‘24‘ back to television for an all-new season. This time it will be a limited series, most likely meaning only several episodes. And yes, Kiefer Sutherland who plays Jack Bauer on the show is in talks to reprise his iconic role. ‘24‘ ended in 2010 after eight seasons. We reported that after the series went off the air, a feature film project based on the series was in development, however it never got off the ground. 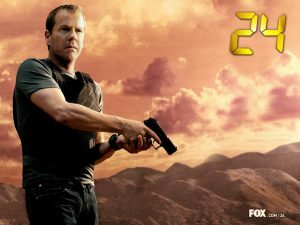 ‘24‘ showrunner Howard Gordon pitched an idea to the network that made everyone excited, therefore we now have a ‘24‘ project in the works. Gordon is an executive producer on ‘Homeland‘ and is currently working on a new high-end show for FX called ‘Tyrant‘, which is being directed by Ang Lee (‘Life of Pi‘). And it looks like former producer of ‘24‘ David Fury took to twitter and said that he is involved in the ‘24‘ reboot, saying “’24′ Eyes Return As Limited Series On Fox, Yep, I’m pulling double duty along w/ TYRANT. Whoo & Hoo! ” So there’s that. This entry was posted on Friday, May 10th, 2013 at 8:55 am	and is filed under Film, News, Television. You can follow any responses to this entry through the RSS 2.0 feed. You can skip to the end and leave a response. Pinging is currently not allowed.